Hand-held is an installation that consists of an apparently empty space which reveals its contents as you explore it with your hands. Today, we regularly use our hands to navigate virtual commercial, social, political and information spaces and relationships using touch-screens, mice and keyboards. Hands, which have evolved to have a great degree of articulation and high concentrations of nerve endings, are reduced to pointers and signifiers. The work occupies the exhibition space in the manner of a sculpture but is initially invisible. Your hands are your active agents with which to explore the space. When your hand moves into the space occupied by a part of the sculpture, its image appears on the skin of your hands and fingers as though it were physically present there. 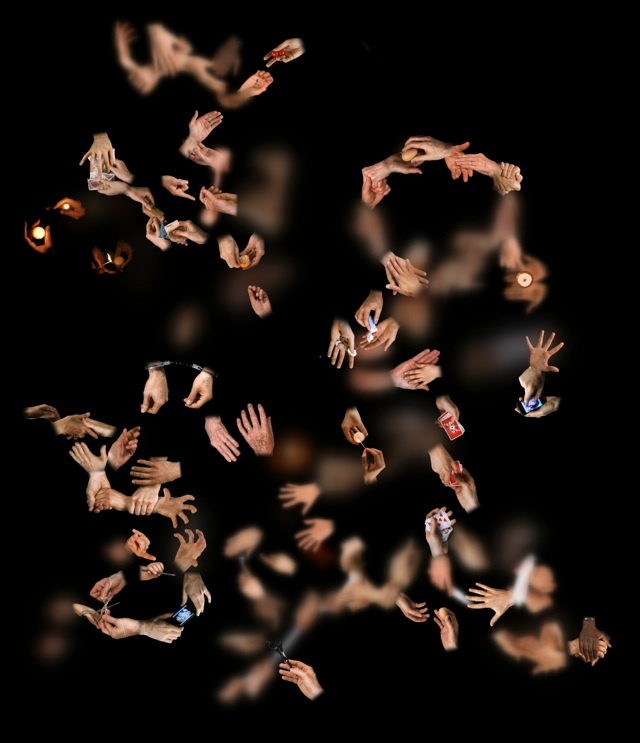 Moving your hand around allows you to discover the extent of the object and its relationships with things around it. As you approach an object, it is first blurry, then comes into focus as your hand comes closer. As your hand passes beyond it, the object against loses focus and dissolves. Some things move as you pass through them as though a short sequence of video frames is spread through space. In other cases, you see a fluid series of cross-sections of the interior of the object as you pass through it. The invisible sculpture is built largely of hands and of objects we hold. The hands (cut off from their bodies like those of the tormenters in Fra Angelico's fresco of the Mocking of Christ) touch each other, pass objects between them in social, practical, financial and symbolic gestures. It is a sort of network of engagements and transactions haunted by spectres of tactility and intimacy. At the same time it is an evocation of the fullness of the apparently empty space all around us... occupied by our projected ideas, our voyeuristic and surveillant gazes, emotional charges, and, ever more so, the invisible communications through which we increasingly convey information, conduct transactions and relate to each other. The installation occupies a 3 meter by 3 meter area. Two HD projectors and a kinect depth sensor are suspended above. 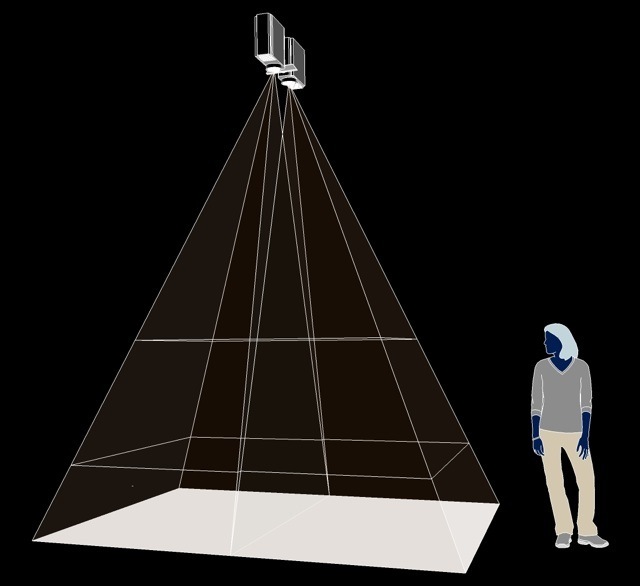 The projectors project images only where they see the body of the visitor. The space is filled with 80 layers of image, each approximately 1 cm thick. The image received on one's hand is of the image layer present at your hand's height in space. Layers seamlessly dissolve into each other, and particular hands and objects fall in and out of focus as you approach and move away from their core position in space creating a strong sense of depth in space and at the same time producing a sense of ephemerality and flux. On the other hand, the slight warmth of the projection where images of hands are present adds a haunting sense of presence and tactile immediacy.